Basil of Baker Street: Baker Street mice - beware! 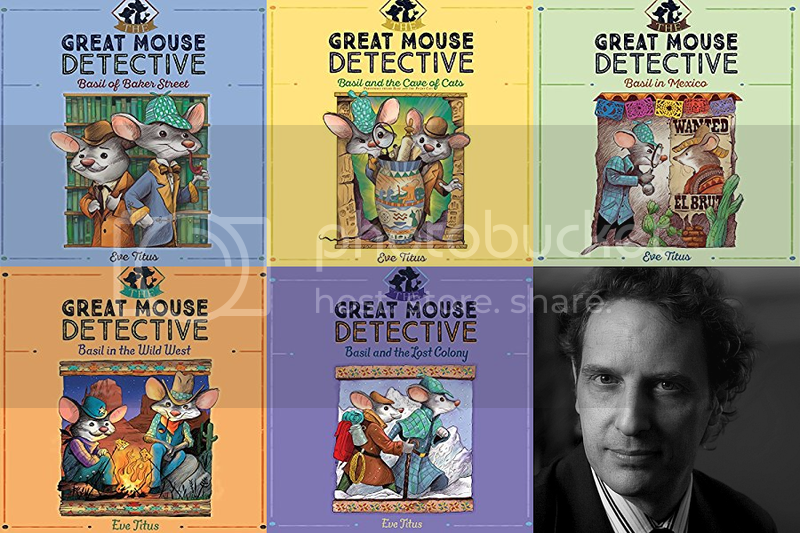 Basil and the Cave of Cats: The Sherlock Holmes of the mouse world solves another thrilling case! Basil the mouse detective sets off on a journey to solve one of the greatest mysteries of mousedom: Do miniature cats exist? Leading mouse scientists aren't certain, but they believe answers can be found in the Far East. Thus begins the story of an unusual quest. As Basil sets sail for the Far East - and the lost island of Kataarh - danger stalks him at every turn. Our hero is determined to unravel the mystery of these mini cats and their mouse king! Basil in Mexico: Basil - the famous sleuth of mousedom - has learned a great deal living in Sherlock Holmes' cellar. Now his sleuthing skills are being put to the test on a wild trip to Mexico! First, mousedom becomes frantic as mice are cracking their teeth on phony cheese made of concrete. Can he find a way to stop whoever is making the counterfeit cheese? Then, he must ferret out the truth when a beloved masterpiece - the Mousa Lisa - goes missing. And finally, Basil must track down the culprit when Dr. Dawson, Basil's faithful friend and companion, is mousenapped! In each of these daring adventures, Basil proves himself to be a true disciple of his hero, Sherlock Holmes! Basil in the Wild West: Tom's eyes bored into Basil's. "I admire and respect you as a brilliant detective, but I must speak frankly. Your chances of capturing J. J. are practically zero. The obstacles are too many and too great. In my opinion, Basil, you're on an impossible mission!" Basil and the Lost Colony: I gasped in horror. Would it be my friend's dreadful fate to perish in the swirling torrent below? "Take care! Take care!" I shouted. But my worst fears were realized. Ratigan went over the edge, dragging the detective with him! Photo of Ralph Lister is courtesy of BESTSELLER the Movie.